When I was first approached to review the Rita 880, I was somewhat skeptical of the product. 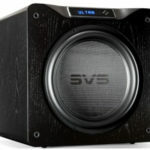 I have often heard products that look superb and that are very well built, but ultimately let me down somewhat in terms of the sound. It’s as if the money, time, and effort went in to the looks as some sort of marketing ploy. Despite what most of us say, most audiophile consumers are men, and some men are seduced by looks. Ian Grant, Grant Fidelity’s Canadian-based founder, along with Rachel Zhang (described as partner and boss), was obviously confident that Rita is far more than just a pretty face. Some audiophiles may see a resemblance of the Rita to other known tube amp makers. This is because Grant Fidelity has partnered with Jungson Audio and become their exclusive distributor. Jungson is a large Chinese based company that has been around for many years supplying OEM parts to other notable manufacturers. For questions and details you can go to Grant Fidelity’s forums. The Rita 880 is a big, voluptuous girl with shapely lines and baby blues (lights that is) that remind me a little of McIntosh amps, including orange meters dancing along to the music. Rita is not a petite girl clocking in at around 90lbs and over 100lbs crated. The amplifier comes complete with one of the most solidly built natural-wood remote controls you’ll find, and a big professional grade power cord. The 4-button remote features a VOLUME control in digital numbered steps, a MUTE, and a MODE button. One caveat about the remote pointed out to me by a left-handed friend, is that the remote control is not designed for left-handed users. The remote has grips protruding from both sides and I would suggest losing the grips all together to keep it sleek. Rita’s illuminated blue bar runs under the orange meters and provides a digital display of which mode you’re in, followed by the numerical volume level. The Stepped Relay (30 resistors) Volume Control goes up to 99; at 25, I found music was plenty loud with my easy-to-drive Audio Note J/Spe speakers. The front panel is a mirrored, polished aluminum. 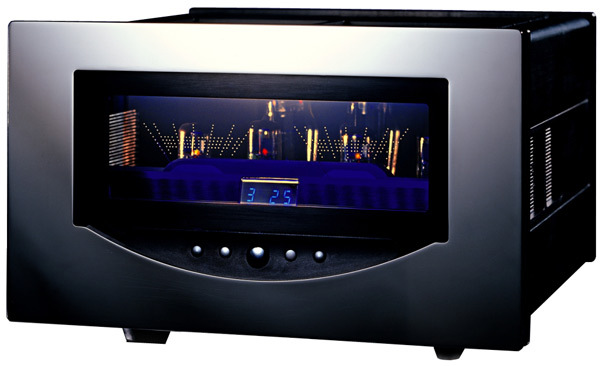 The Rita is definitely a classy looking amplifier, and for around $5k, it’s certainly a steal in the “looks” department. Pictures won’t do it justice. Looking at her back side like most guys would, I found Rita to have two full sets of speaker outputs for 4ohm and 8ohm connections, 5 sets of RCA inputs, an on/off switch for the illuminated lights, a high quality power cord (similar but not quite as robust as the PC1.5), and a set of balanced (XLR) inputs. Rita’s chassis is housed in a “fully sheathed and anti-shock aluminium alloy case” which looks quite elegant. 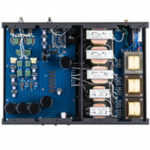 This hand-built amplifier exudes first-class build construction regardless of price. So she looks great and she’s built exceedingly well but what about the most important thing, sound? Well, on first turn-on, I felt that the sound was bullying my Audio Note J’s which are quite used to the slightly more delicate nature of the OTO Phonoe SE with its 10-watt EL 84s. The Rita with its big KT 88s certainly creates a different, but I will say equally viable, perspective. The Rita produced a tight, gloriously transparent sound with impeccable articulation. The top-end was fast, dynamic, smooth, like very good tube amps should be, while creating an almost solid-state grip on the lower registers. I say almost because unlike some hybrids which often sound like two competing technologies vying for supremacy, the Rita sounds completely natural. It has a warm, organic presentation but retains the inviting flavor of tube reproduction. No, I have not quite lost my mind in some weird, objectification fantasy. No, Rita really does run cool. 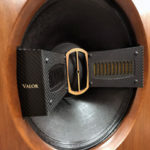 A 45-watt pure class A amplifier with KT88s should be an incredibly hot running amplifier, but this tube amp has a rather intriguing design in which it runs cool to the touch. You can touch this amplifier’s front sides and back and not really know that it is an amplifier. There is some warmth from the ventilation at the top, but interestingly it, too, is about as warm as my surround sound receiver. Our favorite part of Rita design is the ‘runs cold’ approach, which is 2-fold approach in essence, the first being the engineered, natural ventilation with special heat dissipation material and methods. Many think with this kind of power she should be ‘hot to touch’ and be steaming up any room you see her in. Not to be, she’s a cold one. It’s quite the unique circuit designs that I can’t go into details on, but it involves how the feedback is handled and the relatively low rail voltages. For those audiophiles who won’t consider tube amps because they are just too hot can now have their cake and eat it, too. You can have a side of ice-cream with your cake without it melting. Now somewhere along the way I missed the fact that Grant Fidelity sells more than tube amps. My personal view of audio is that the system approach allows consumers the ability to determine where a company’s sonic belief system lies. Mixing and matching can be effective for system building, but it also yields a far higher likelihood of continual system unrest and a much higher chance of incompatibility. So, I shot off an e-mail asking them to send whatever gear that matched the Rita. A few days later, I got a power conditioner, power cords, CD player, interconnects and speaker connectors. I’ll start with what showed up first. The RPF-120 power conditioner and 2 PC 1.5 OFC Power cords showed up. The 1.5 designates length in meters. The Power Conditioner houses 8 connections but it is not a surge suppressor. It weighs roughly 5kg and has a mirrored Grant Fidelity label which matches the aesthetic of the Rita nicely. The rather robust power cables are 16-gauge, twisted copper with Teflon insulation and hospital grade connectors. They look and feel extremely rugged. So I immediately plugged in the power cord to my 12-year-old Cambridge Audio CD 6 CD player and into the power conditioner to see what kind of improvement could be made by such modestly priced pieces. The result was not subtle. Bass weight was improved rather dramatically, and the entire treble band of my CD player was cleared up to sound less bright and spitzy, with everything coming from a deeper-black background. The difference on acoustic guitar was quite a revelation but even on pop music – Sarah McLachlan’s and Delerium’s “Silence” — resulted in a sound that retained the power but without a hint of glassy CD sound. Having owned my CD player for 12 years, it was the first time it managed to sound a sizeable step up from its class. Curious and impressed as I was, I wanted to try the Conditioner and cables on my Audio Note OTO Phono SE, and here again I was quite impressed with the results. The OTO is often said not likely to take advantage of power cables; but I have to put my skeptic hat in the drawer and advise that if you have the OTO, or Audio Note amps, you owe it to yourself to try these power cords – for the price of this conditioner it is certainly worth an audition in your system. What I found most interesting is that I didn’t need to turn the OTO’s volume knob up as high to get the same perceived volume level. Now, this may not be a big deal for some, but with the OTO and its mere 10 watts, well you want to wrestle as much power as you can get. I can not recommend these power cords and conditioner enough especially when you factor in the prices, which, in the world of audiophilia, is a pittance. Next to arrive was the MCD 100 CD player, which, for some reason, looks like the bottom level of a pyramid. Although no documentation came with the unit, from what I can gather it is a relatively new product for Grant Fidelity. The remote control is an aesthetic match to the Rita but has Chinese characters at the bottom. The same caveat about the remote control applies. Unlike the beautiful-looking Rita, the MCD 100 is a plain black box with a black front panel and a plain blue LCD providing track and time. At the back of the CD player pointing horizontally toward the back wall are three tubes, which, of course, you can roll. Despite the non-aesthetic match, the MCD 100 is built like a tank. The player offers full balanced outs, digital and optical outputs, RCA outs, and a coaxial output. This CD player is easily one of the best I’ve heard under $2000, and with exceptional build construction and tubes to boot. I’ve heard a number of tube CD players, and the MCD is among the few that never hint at veiling. In fact, it is fast, open and offers more resolution than its asking price may lead you to expect. Running it into my OTO, I took great pleasure basking in the openness and ease in the upper-mid, treble band. It never got hard or bright. If I had a complaint, the MCD 100 might have lost out some in the dynamics, creating a relatively 2-dimensional perspective and slightly less organic than some of the best CD players. But again, with the perspective that this player is $1799 (now $1,499), I can’t find any fault with the sound quality on tap, and with its well-above-average build quality. Interconnects and speaker cables I enjoyed testing. 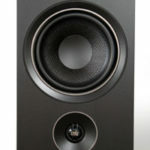 The MSC speaker cables are well-built with spade type connectors, and I found them to be a nice addition. No, they were not “wow” better than the Ultra Link that I’m using, but I felt a bit of a hole when I put my old ones back on. Grant Fidelity didn’t provide pricing information for me so they may not be in production yet. The MRCA-1 interconnects, however, was quite intriguing. I compared the cable with my Tara Labs Prism 11, and what I found was that the Prism 11 sounded a fair bit darker. The MRCA-1, in contrast, allowed more background content and seemed to me to create a more informative experience. I never touched the volume control of the amp and on the Terminator 2 soundtrack, the backing sound effects were clearly more easily heard. You’ll have to weigh the price difference here though, as the Grant Fidelity cable is nearly ten times the price of my Tara labs. In my system, I preferred the Grant Fidelity interconnect for the added openness and less veiled presentation. Apparently, Grant Fidelity offers less expensive alternatives so it might be worth a listen to those as well if money is a concern. I might take issue with the notion that other tube designs have problems with bass and treble extension, which I find to be more of a system matching issue, but it’s also tough to argue that the Rita, in any way shape or form, lacks the hard hitting attributes of solid-state while not succumbing to their pitfalls. Adding to the Rita with exemplary and wallet-friendly PC-1.5 power cords and a superb RPF-120 power conditioner added a much more stable foundation. The MCD 100 CD player and matching interconnect is icing on the cake; but when I factored in the price of this CD player I was left highly impressed and a little dumbfounded. This CD player on it’s own, with my Audio Note gear, was really rather impressive, all day listenable, open, insightful and just darn enjoyable. An entire front-end for under $9,000 (now $7,535 with system discount) that actually brings music to life without making you yearn for something else is quite impressive. Apparently they are working on some loudspeakers and turntables to complete the chain. I shall try to be first in line to see what they come up with because for the audiophile on a budget, you’ll be hard pressed to find a more complete overall package in terms of build quality, and sound reproduction than what is offered here. Highly recommended!